This was not a formal presentation to DRC, simply a presentation for discussion. They will likely be back to DRC at a later date with a formal proposal for this site. The revised design for Edge College Hill Two would involve a building of 11 stories, about 40 feet shorter than the original design, according to attorney Zachary Darrow, who represents the developer, Vision Properties of Conshohocken, Pa. 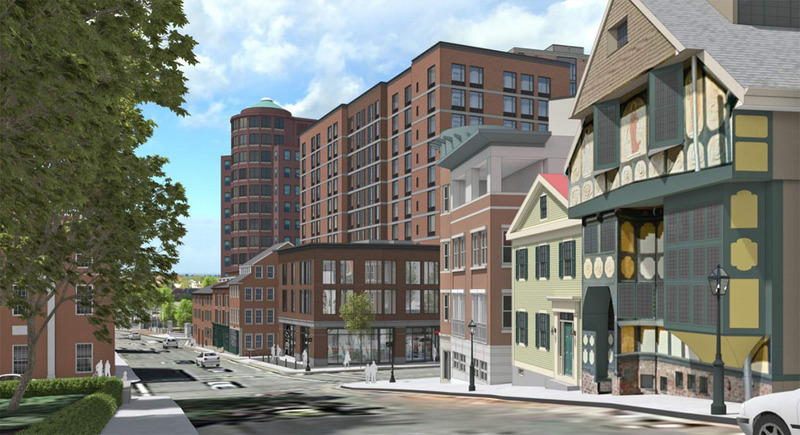 The L-shaped apartment structure would wrap around the Congdon & Carpenter building, which is a series of three colonial-era buildings on Steeple Street, said architect Martha Werenfels, a principal at DBVW Architects. But the new design would pull the apartment building off the street at South Main Street to allow a view of the Congdon & Carpenter building coming down College Hill, Werenfels said. 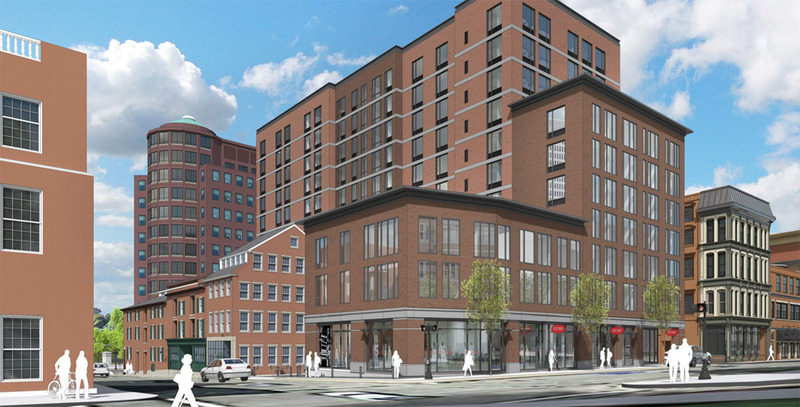 Providence zoning allows a nine-story building on the site, which is now a parking lot. The plans seek a 20 percent bonus for development of two additional floors, which the developer is seeking through a waiver tied to a public use of the first floor. The design presented Monday has room for four retail tenants on that floor. In your opinion Jef, does this get built? I’m still shocked and amazed that Edge College Hill 1 is actually under construction and didn’t turn into a vaporscraper (although under a previous developer it was a vaporscraper). So… yes, it seems the developer has the ability to do it. A building that gets announced with great fanfare and promise, then never happens. A play on the software industry’s vaporware. Jef, is Hope Point Tower a vaporscraper? I’m humored by how the horizontal white bands on the upper floors make it look like the Paul Rudolph-design Beneficient House apartment building on Weybosset Street. I’m into it! It’s so nice to finally get some urban infill and density in Providence. My only gripe is that I wish the upper elevations were glass and steel – which would provide a sense of lightness to the overall mass of the proposal. I’m probably most excited about the 4 retail units on the ground floor. This is what is missing from that area. Re-creating a North Main Street shopping district (originally called “Cheapside” back in the 1800s) will be such a great cultural gem for the base of College Hill and the fringe of downtown. Maybe the entire street from Roger Williams Park to Fox Point becomes more walkable now. Proper signage depicting the bounds of the district could help the southern end of the street.